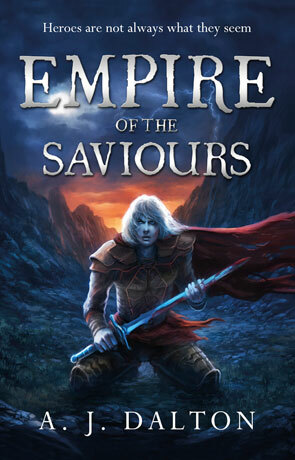 Empire of the Saviours is a very, very clever novel than manages to offer something different over the traditional fantasy fare, using tried and tested fantasy tropes - young boy from humble beginnings find he has incredible power - but then creating something quite different, fresh and unique that stands out from those around it. Within this standard fantasy world that mixes a medieval level of technology with banned magic, civilized people live in fortified towns with walls guarded by an army of Heroes. These Heroes are tasked with keeping the vile pagans out and the good people in and they are overseen by living Saints, powerful beings who visit each town several times a year and extract a tithe from the children who are coming of age. The story begins as the young lad Jillian - who is about to come of age - unleashes banned pagan magick by accident and the town turns against him. Forced to go on the run and chased by the very Saints themselves, it's not long before his infamy spreads and many begin to seek him out looking to take advantage of his growing power for their own ends. The society itself is built around a regime that uses religious doctrine and fear of both physical and spiritual torment to strictly control the populous. The all powerful Saviours control the Saints who in turn lead the army of Heroes and Priests. It quickly becomes clear however that these Saints and Saviours aren't exactly angels and are in reality a type of blood-thirsty vampire simply looking after their livestock (without the aversion to daylight). Presenting these creatures of the dark as holier-than-though is a stroke of genius. As you can imagine the theme of religion plays a large part in the story and in places it feels a little over-done however there is no denying the power that these messages impart. All this world building is provided by exposition, brief enough and written engagingly to prevent slow down of the pace to any noticeable degree. There are some pretty dark parts to the narrative too, it's not the most pleasant of novels and doesn't hold back from describing some of the more depraved atrocities that these Saints carry out (there is one that reminds me strongly of the "Bishop of Barton Wells"). It doesn't however go as far as some authors do though (like Terry Goodkind for example) and these descriptions do prove very effect in building up a strong dislike for the antagonists, it has to be said that the bad guys are about as evil as is possible. As a counter-point to this darkness there is a subtle humour to some parts of the story and any scene with the quite brilliant Torpeth (who appears to spend most of his time naked) are just laugh-out-load funny. Something else that makes a big difference is the characterisation which the author has totally nailed, not just the principle protagonist but all the larger than life characters he meets along the way, from heroes to pagans to monsters and gods. Empire of the Saviours is a great novel, managing to break out from the standard model of high fantasy novel with a great cast, effective world building and magical ideas. Recommended to anyone who wants to read something a little bit different. Written on 16th May 2012 by Ant.